Bake the biscuits first. I suggest the Rosemary Buttermilk Biscuits recipe, but if you must, you can buy biscuits from the grocery store for a shortcut (don’t tell anyone). While the biscuits are cooking, start the bacon. The only issue with cooking the bacon first is you have to try to not eat the bacon before finishing the rest of your sandwich. You should probably make extra. 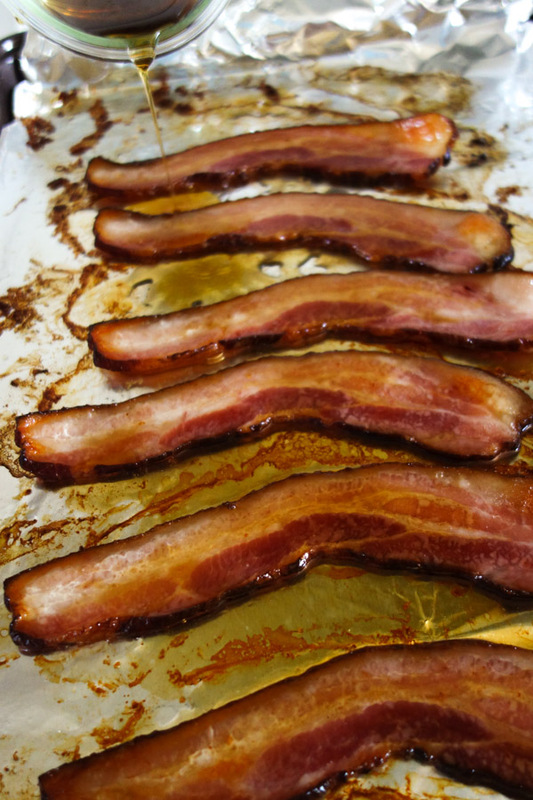 To make the maple glazed bacon, line a baking sheet with foil. Bake the bacon for 15 minutes on 400 degrees. Remove the bacon from the oven and turn it over. Drizzle the maple syrup over the bacon and bake it for another 10 minutes. I’m getting hungry. Heat olive oil in a small skillet. Slice the tomatoes and cook for one minute per side in a hot skillet. Set the tomatoes to the side. Add more olive oil to the hot skillet. Crack one egg in the skillet and cook it about a minute or until the egg whites start to set. Flip the egg and cook it for another minute. 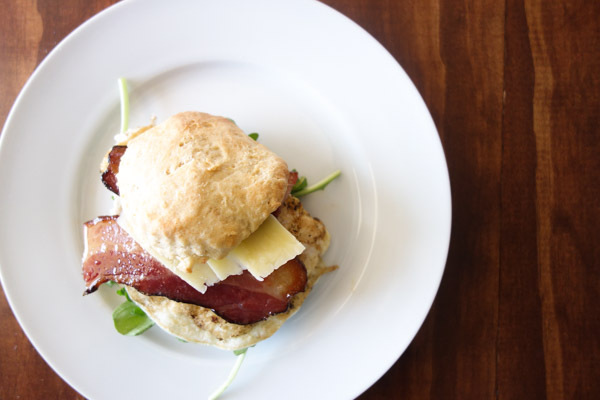 Cut the biscuits in half and line with arugula. Layer the egg on top of the arugula, then layer the bacon (cut in half). Finally, add the cheese and top with the other half of the biscuit. Voilà. Breakfast is served! Bake the biscuits according to Rosemary Buttermilk Biscuits recipe or package directions. Preheat oven to 400 degrees. 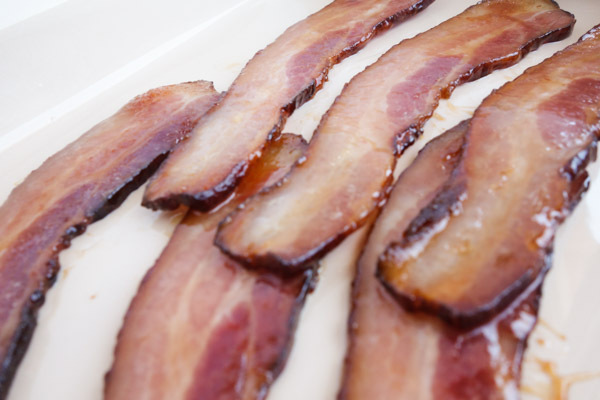 Line a baking sheet with foil and arrange bacon approximately 1/2 inch apart. Bake the bacon for 15 minutes. Remove the bacon from the oven and turn over. Drizzle the maple syrup over the bacon and bake for another 10 minutes. Remove from oven and set aside. Heat olive oil in small skillet. Slice tomatoes and cook in heated skillet for 1-2 minutes per side. Crack one egg in the skillet and cook for approximately one minute or until the egg whites start to set. Turn the egg and cook it for another minute. Repeat with as many eggs as needed. 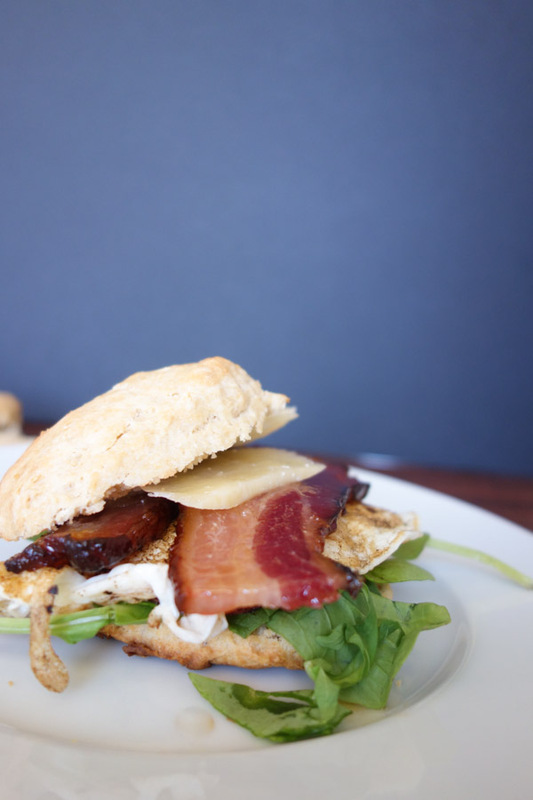 Cut the biscuits in half and layer with arugula. Layer the egg on top of the arugula, then layer the bacon (cut in half). Add the cheese and top with the other half of the biscuit. Oh my! This looks awesome! !